As southern Sudan heads towards a January 9, 2010, referendum on secession, it is battling to contain the biggest kala azar outbreak in the region in eight years. Juba, December 16, 2010—As southern Sudan heads towards a January 9, 2011, referendum on secession, it is battling to contain the biggest kala azar outbreak in the region in eight years. The severity of the outbreak is just one symptom of the wider medical humanitarian crisis facing the region, including abysmal lack of access to health care, chronic malnutrition, regular outbreaks of preventable diseases, and insecurity that displaces communities and destroys lives, the international humanitarian medical organization Doctors Without Borders/Médecins Sans Frontières (MSF) said today. Kala azar, or visceral leishmaniasis, is a neglected tropical disease contracted through the bite of a parasite-carrying sandfly, and is endemic in southern Sudan. Symptoms include an enlarged spleen, fever, weakness, and wasting. It thrives in poor, remote and unstable areas with extremely limited health care. 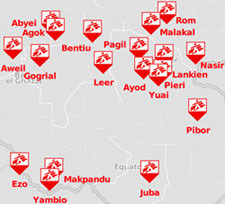 Click to see the full map of where MSF is working in Sudan. If untreated, kala azar is fatal in almost 100 percent of cases within one to four months, but timely treatment can mean a success rate of up to 95 percent. By the end of November 2010, MSF had treated 2,355 people for the disease in Upper Nile, Unity, and Jonglei states—eight times more than during the same period in the previous year. The current outbreak was further exacerbated by the population’s already weakened immune systems due to increased levels of malnutrition. In the first 10 months of 2010, MSF admitted to its clinics 13,800 patients suffering from severe malnutrition, a 20 percent increase compared to the same period in 2009 and a 50 percent increase compared to all 2008. Additionally, tens of thousands of Southerners are returning from northern Sudan and further abroad in advance of the upcoming January referendum and will thus be exposed to diseases endemic in the South, such as malaria, measles, meningitis, and tuberculosis. Their presence will put enormous additional strain on already limited resources, including food, water, and health care provision. Insecurity also remains an ever-present reality in southern Sudan. Throughout 2010, more than 900 people were reportedly killed and 215,000 people displaced due to inter-tribal violence and attacks by rebel groups such as the Lord’s Resistance Army (LRA) and other militias. MSF has been providing emergency medical humanitarian assistance in Sudan since 1979. Currently, MSF runs 27 projects across 13 states of the country, providing a range of services, including, primary and secondary healthcare, emergency response, nutritional support, reproductive healthcare, kala azar treatment, counseling services, surgery, and pediatric care.